On my blogsite, there is a link to the YouTube Culinary Science video. I noticed that one of the link is a demo on how to prep bread dough in 5 minutes and on the next day you have artisan bread for supper. I thought I give it a try since I posted it there. The bread turn out great. The first bread was a tester, but it turned out just in time for my lunch with Chicken soup (canned). Then, the next bread #2 turned out wonderful and finished in time for my supper. I even had enough time to crop fresh corn from my garden and made them into soup. So, the "5 Minutes a Day Bread" is worth giving it a try. I might even buy the book. Here is how my Pandan Chiffon Cake with Butter, no vege oil, turned out. 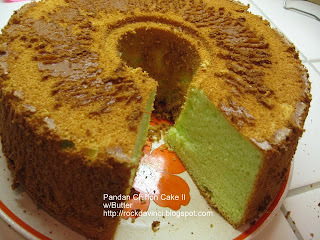 I used the same recipe from the previous Pandan Chiffon Cake. I omitted the vegetable oil and replaced it with 2 oz of butter. I was careful to whip the egg whites to stiff peak but not dry, then fold it in gently to the egg and flour mixture. This time the cake volume is higher than before. The cake rose about an inch during the baking. It is not as high as the Seadragon's Pandan Chiffon Cake. In her photo, her cake rose above the rim. I made sure the tube pan I am using is the same size. 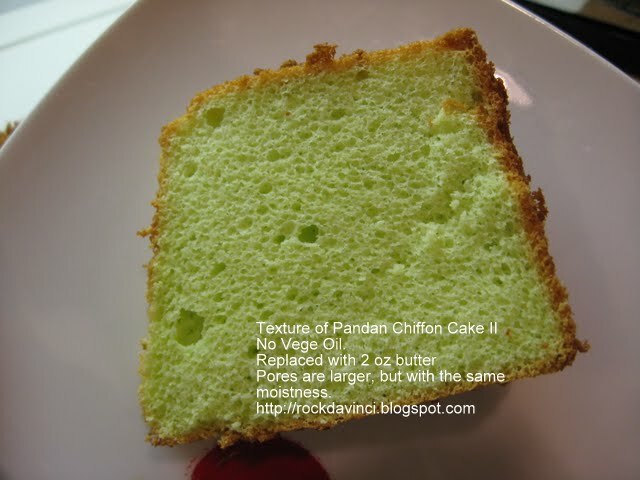 The texture is not as 'fine' when the vege oil was mixed in. But this is too early to decide if that is the reason. I will need to bake a few more times. It maybe because I have over beaten the eggs . . . 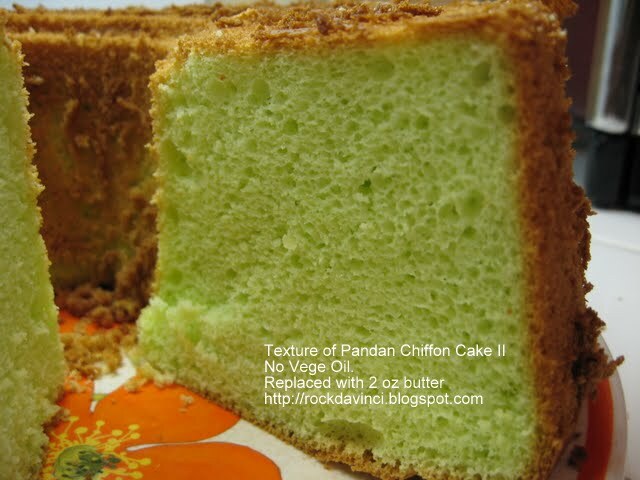 The cake is moist just like the Pandan Chiffon Cake I made previously. It tastes delicious still - light and moist. I am trying to upload the video to YouTube of how I folded the egg whites into the egg/butter mixtures, but it is taking a long time. 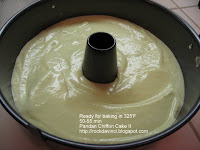 http://www.youtube.com/user/UMECHANKICKS?feature=mhum And I am happy to see so many other How To's at YouTube related to Chiffon Cake making. I spent over an hour studying how others are doing it. And I am convinced that mixing with bare hand would be the best method to mix the egg whites... and I would like to try that next. It taste so good that I did not make time to make any frosting or cream... I should have. Maybe not this time round, but I will try to give it a finished look the next time. PANDAN CHIFFON CAKE - doesn't it sound mysterious and delicious? 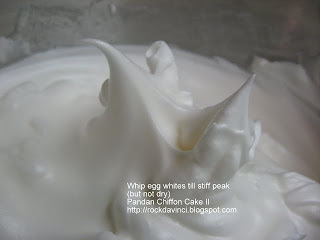 I came across this recipe while visiting few of my favorite food blogsites (listed under "My Inspiration". ) 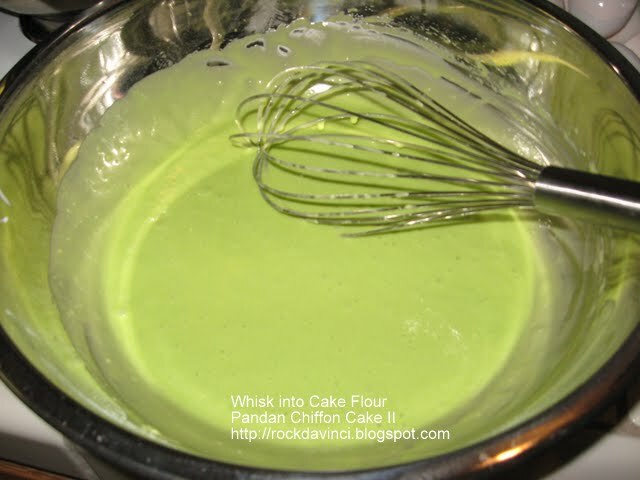 I always wonder what that peculiar flavorful aroma I smell when I go near Asian pastry with 'green' color to them. I thought it was coconuts. After understanding that 'stuff' is Pandan - I went to the local Asian market in Sacramento to search for it. I found the fresh Pandan leaves. It was named Landau or something like that. I was not sure what it was, so I asked other shoppers, and they confirmed that it is Pandan leaves. Sadly, after the purchase, my work got so busy, I did not have the time to prepare it. So, after a week, I had to discard them. 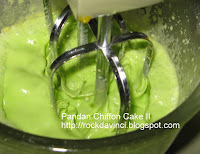 But I had Pandan Paste in my pantry from the previous week's shopping. (I was bit hesitant to use it because of the food coloring, but I only used a drop... it turned out beautiful color and added a delightful complimentary taste to the coconut flavor.) I didn't have fresh coconut meat to shave either. So, I used coconut powder mix to suffice. It brought back the memory of how we used to shave the fresh coconut meat with a shaver and squeeze the fresh milk out -- that was a good ole' days in S. Viet-Nam. In San Jose area, there are several bakeries (Hong Kong style) in 99Ranch that are quite popular. And many people love their cakes. I could not figure out what type of cakes they are. Now, I know--it is this Chiffon. The recipe for this Pandan Chiffon Cake is from the Seadragon's site at http://cornercafe.wordpress.com/2010/02/20/pandan-chiffon-cake/#comment-1635 As many other experienced bloggers have commented at both Happy Home Baking site or at Seadragon, the final gentle folding of the egg white is indeed challenging. This Pandan Chiffon Cake turned out great. Baked in the Angel Food Cake Tube pan. Baking at 160C. 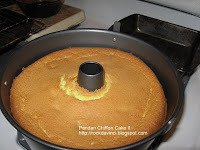 I read other bloggers' comments that baking at lower temperature prevents cracking at the top during the rise. Irregardless, I am very pleased with the result and taste. It looks great and yummy. I thought I would try baking Canneles de Bordeaux using Melon flavor Rum. But ... I should have stayed with the Dark Rum. Tonight's testing was to bake test with melon flavor rum, and using silicon baking mold. Even though I do not have a "silicone Canneles molds", I improvised the regular silicone baking mold to test. The baking result: The copper canneles molds are still the best. The aluminum canneles molds did a good job. The silicone baking mold did not caramelize the outer part of the Canneles as copper and aluminum molds did. But, it turned out interesting, I think. Taste testing: The Canneles baked in silicon mold's outer shell did not pass the Canneles' egg shell crunchiness. Even after 1 hr 40 min of baking, the caramelization is not 100%. The texture is chewy. I made petite canneles rather than the usual demi size because I wanted to quickly bake and find out the result. So, what to do with pounds of beautiful home grown Romano Tomatoes that my friend game me? and Eggplants? and Bell Peppers? I had a couple of ideas, but I chose to make Lasagna. Lasagna seems so simple to make. A layer of this and a layer of that. But, the Lasagna pasta is not very forgiving to prepare since all our pots are round, and they are rectangle. But I came across this pre-cooked lasagna. It seems that all I need to do is add them between the layers of sauce. I tried it and I love it. 2 Tbsp Oregano. Add 1 Tbsp at a time to taste. Pan: 9x9x2-1/2 baking dish or any others, but don't forget to increase the amount of lasagna pasta. Baking Temp: Bake covered in aluminum foil at 400'F until the internal temperature reaches 165'F or higher and bubbly. Slice eggplants lengthwise and grill in George Foreman's countertop hamburger grill. It should be somewhat translucent. Cut with scissors into smaller pieces. Set aside. Saute onions in butter and olive oil till translucent. Then, add bell peppers. Stir fry 1 min. Lower heat and add Traditional Basil Pesto. Stir to incorporate. Add Romano Tomatoes. Add salt, black pepper, and 1 Tbsp Oregano. Turn to medium high heat. Cook 3 min. Medium low heat - Add Spicy Tomatoes and Pesto sauce. Taste and add more salt and Oregano, if needed. Stir and cook till heated through. Time to assemble -Preheat oven to 400'F. Have aluminum foil handy. Extra baking pan or sheet to catch spill. Wrap up in Aluminum foil and place on top of baking sheet or another larger size baking pan. Taste test: Delicious. I am sure there are other ones out there that is also. But I got to use all the homegrown veges in one dish, and thank goodness for the "no boiling required" lasagna pasta and George Foreman's grill. It saved me time. I would consider to omit the bell peppers after stir frying them. I tasted bitterness in the outer peel. May be peel the bell pepper before stir frying? that may be a good idea. Summer time here at my mini-garden keeps quite busy. Eggplants, pumpkins, lemons, limes, quamquats, romano tomatoes, upside-down tomato plants, Kaki trees, cucumbers, herbs, strawberry plants, and corn. Corn came late this summer. I am not sure if the seed was too old or my soil is not fat enough. But here they are. No insecticide odor and fresh. & they are beautiful plants.